When we first embark upon the Brazilian Jiu Jitsu journey, we typically do it for our family, our friends, or ourselves. As women and nurturers, though, it changes somewhere along the way. We still do it for ourselves but we also see the bigger picture. We see how the camaraderie engages other women. 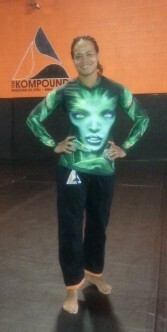 We see how integral we are to growing the community of women training Brazilian Jiu Jitsu. Most importantly, we see the realized value that a galvanized group of women can bring to the sport. We are no longer unicorns. We are in every class. You can find us teaching class. You can find us competing on the big stage, and you can find us coaching and cheering our cohorts on to victory. We must take care to ensure that the path in which women pioneers have paved before us continues. Getting us women in the door is very difficult and keeping us requires every bit of measured effort. One such practitioner that bears all of this in mind is Hillary Van Ornum. Hillary has really taken the ball and run. Hillary understands the responsibility that her place in this sport holds. Hillary has a brown belt in Judo and a black belt in Brazilian Jiu Jitsu under Michael Chapman at Impact Jiu Jitsu. Hillary happened upon Brazilian Jiu Jitsu in 2005 after gifting her brother a membership at a local gym. They would both enroll in an MMA program called combat defense systems that would teach Kyokushin karate, Judo, Krav Maga, Vale Tudo, and Brazilian Jiu Jitsu. After a year, they followed their Judo coach and trained Judo full-time for the next year. For those two years, Brazilian Jiu Jitsu just wasn’t at the top of her list and she wasn’t sure what this concept of “rolling” was all about. Still, Hillary and her brother continue with the sport. Hillary has always been athletic. From the wee age of four she was a competitive equestrian. She continued that through high school and found passion in other high school sports. She even played basketball at the college level. She had a desire to play football, as well. In the ‘90’s, girls playing football wasn’t particularly accepted. Hillary believes that the barriers associated with her jaunt onto the football field are what spurred her desire to dive into combat sports. Another aspect of our growth that Hillary finds particularly challenging is representation across the various divisions at tournaments. She adds that if we all made a commitment to compete, all the women’s divisions could be represented. This only leads to our growth. Hillary champions the idea and finds it particularly amazing that we can measure our technique and game through competition. This is all a learning experience and if you win…well, that’s just icing on the cake. Hillary is focusing on her guard game at the moment and lists the bow and arrow choke as her favorite finish. She had her very first match as a black belt at Pan Ams this year. She won by advantage against a highly seasoned competitor. Hillary is no slouch in competition. 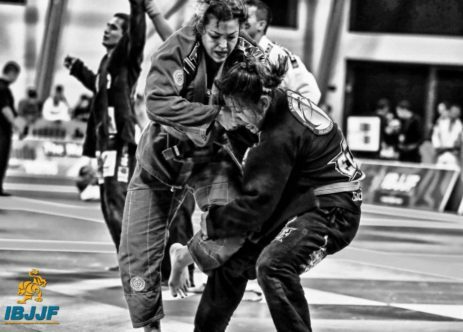 Her list of titles include 2015 Brown Belt Adult Super-heavyweight World Champion (gold),2015 Brown Belt Masters 2 Super-heavyweight World Champion (gold), 2013 Purple Belt Masters 1 Heavyweight Pan Ams Champion (gold), 2013 Purple Belt Masters 1 Open Division Pan Ams Champion (gold), 2012 Purple Belt Masters 1 Heavyweight Pan Ams Champion (gold), and 3-0 Amateur MMA. Go, Hillary, go! While most of us in the sport know that Brazilian Jiu Jitsu is life, we also know that other aspects of our life give us balance. Hillary is fortunate in that her husband took up Brazilian Jiu Jitsu four years ago. The dynamic is interesting in that while most men finally drag their significant others onto the mat, Hillary finally got her husband on the mat. Hillary is a far more advanced player but finds that her husband is a great training partner. That, a wonderful career, and an innate desire to be a better version of herself are what get her out of bed ready to seize the day. As Hillary continues her Brazilian Jiu Jitsu journey, she hopes to be someone in the community that other women feel comfortable coming to with questions, problems and concerns. As the first female black belt at her academy, which boasts over 100 women, I’d say that she is well on her way. 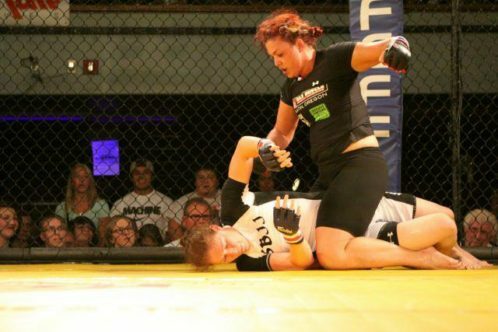 Sharicka Long-O’Neill, is a blue belt with the Kompound Training Center out of Littleton, CO. She has been a jiu jitsu practitioner since July of 2012. She is a mom and a ten-year veteran of the United States Navy. Her hobbies include fitness, cooking, and traveling with her husband of five years. 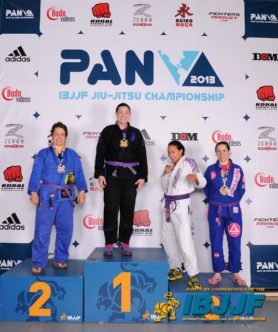 As an older and heavier woman who just started training in Brazilian Jiu Jitsu, this posting was very motivating to read this morning. great article! 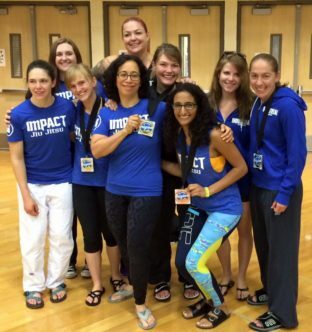 Reminds us the importance of what we do in inspiring other women to get started on the mat.